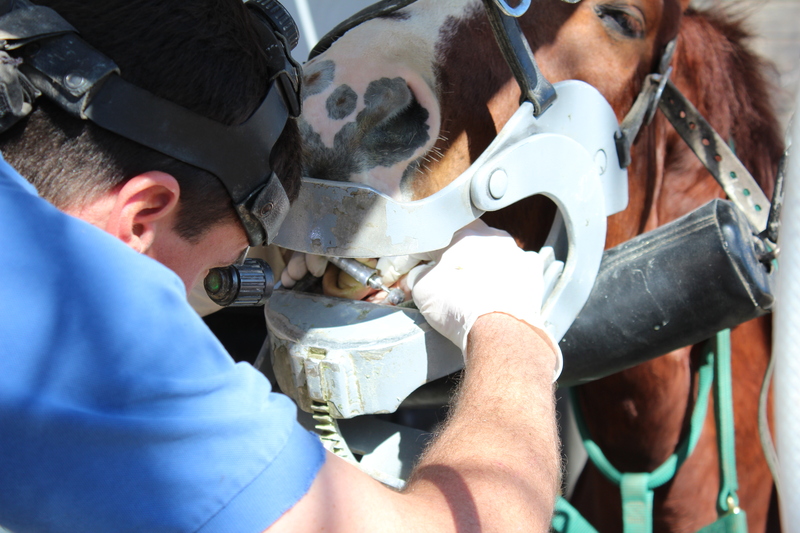 This morning I had my first experience with equine dentistry. I had tons of questions, and the veterinarian was super nice and actually a little excited that someone wanted to hear about what he does for a living. He has a cool trailer hooked to his truck that expands out and has everything he needs from tools to a portable stall, to the sling you see below to hold the horse’s head. 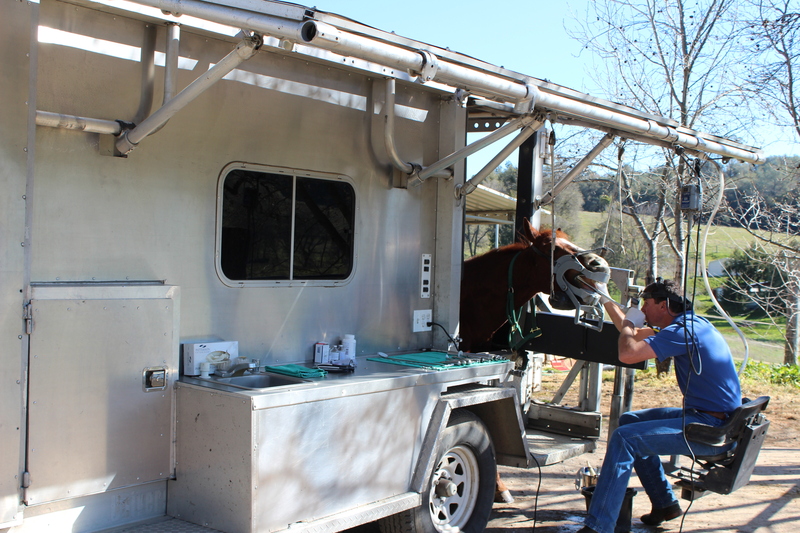 The very first thing the vet does is to tranquilize the horse… for fairly obvious reasons. Sue got pretty mellow, pretty fast. I walked him over to the trailer and we put him in the stall. He immediately leaned both on the stall and on the little chin rest. 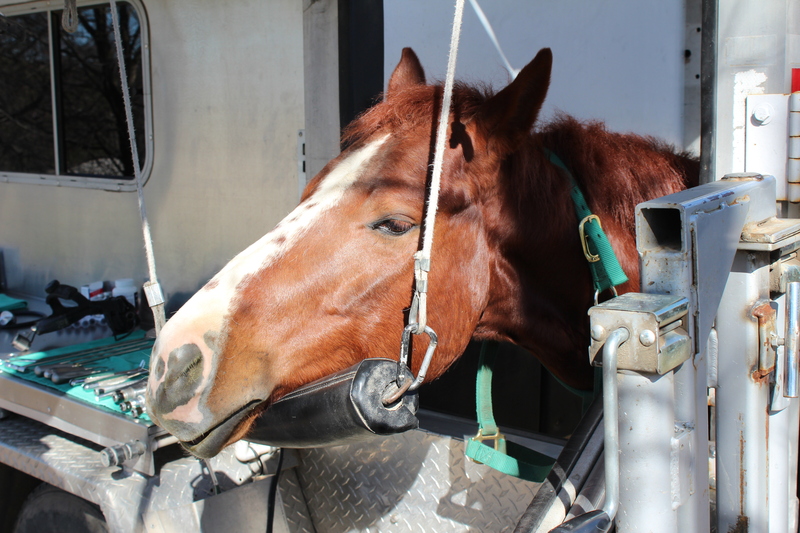 The vet then explained everything he was going to do… basically, if a horse’s teeth do not wear evenly (tons of reasons why they wouldn’t) it can cause eating problems, tooth loss, ulcers in their mouth, etc. So once a year, the vet has to basically grind their teeth down to smooth off the sharp edges and realign the bite. He started with the front teeth, or incisors. 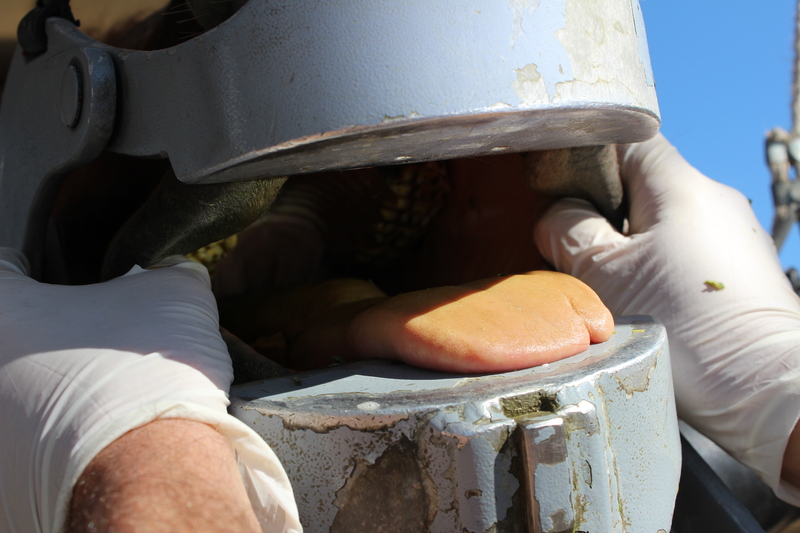 None of this hurts them since the “pulp” in their teeth is buried down inside. Yes, that’s his massive tongue just hanging out. He was way mellow. The vet then had me look inside Sue’s mouth and feel some of the sharp edges of the molars. He had one little spot that was ulcerated (similar to how the inside of your cheek feels when you bite it). It’s kind of a terrible picture because my camera wanted to focus on the wrong part, but you can see how far back it goes if you look closely. The scary looking contraption on this head/mouth is just their to hold it open for the vet. He also had to file down the sharp canines. Only stallions and geldings have them and in the wild they’re used to fight. 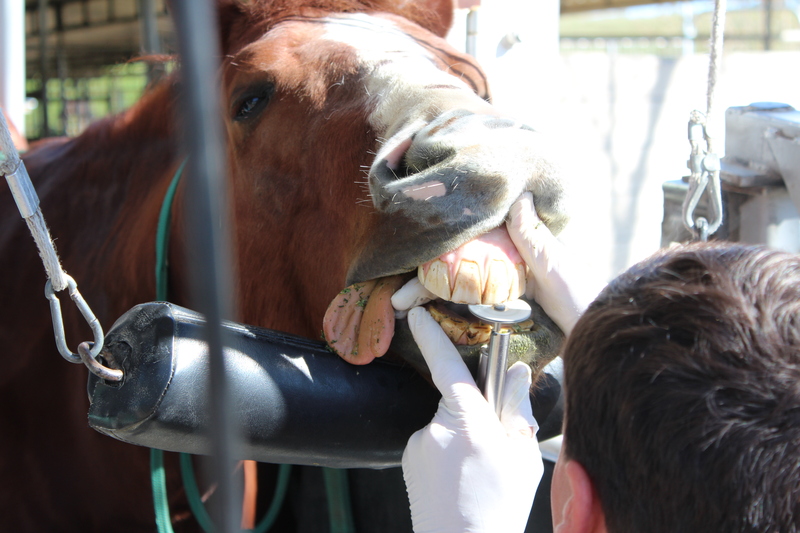 In domestic horses, they are the most sensitive teeth and can cause pain if the bit hits them and they’re too long. This is his setup… it was really neat! I absolutely love this vet! He answered every question I had, was happy to let me take pictures, and was really great with Sue. Once he was done, I took Sue back to his stall. He had to wait about an hour to eat (and to come out of the drug haze) but is doing just fine!